TA cloning is used to clone PCR products. It takes advantage of the 3′ A overhangs added during amplification by Taq and some other polymerases. These sticky ends enable insertion into a linearized vector with complementary 3′ T overhangs. GC cloning is similar, and is based on the finding that Taq actually adds a mixture of 3′ A and 3′ G overhangs. 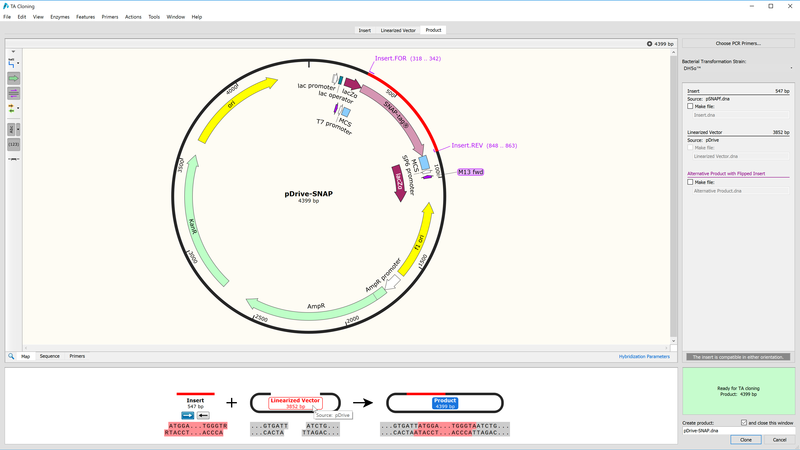 SnapGene provides a simple interface for simulating TA and GC cloning. A variety of commercially available linearized TA and GC cloning vectors are embedded in the software. Please click below to see a screenshot and a brief tutorial video. A list of annotated TA and GC cloning vectors is available online.